The largest water bomber in the world is sitting in Gregoire Lake - the Hawaii Mars, one of two Coulson Flying Tankers that can carry a stunning payload of over 27,000 litres of water. 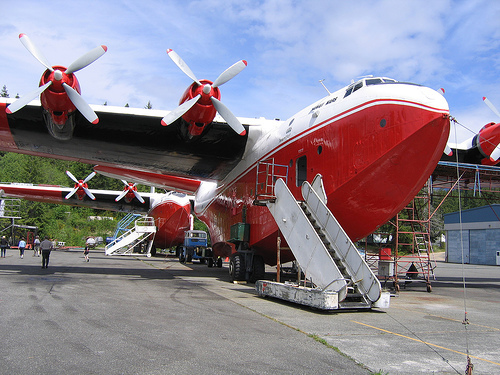 Normally, it's stationed at Sproat Lake, just west of Port Alberni on Vancouver Island. 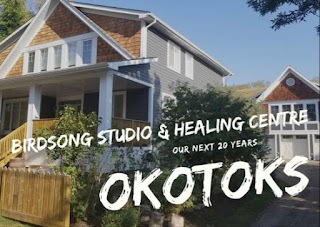 I know the spot well because I used to live there, in a 1970s style, 2 x 2 construction trailer, on a property owned by this lovely older couple. I lived up on a hill overlooking the lake; they lived in a 100-year old home that had apparently been a summer retreat for Ulysses S. Grant; his initials were carved in the foundation. From the front steps I could see the distant sliver of orange floating off on the other side of the narrow lake. Because of the tenacity of the fires in our region and the extraordinarily dry conditions - we have not had any significant rainfall since the snow melt - the Hawaii Mars is enjoying its temporary digs in our local lake, a recreational honey pot, a short 20-minute drive out of town. 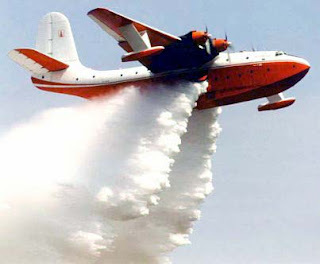 It's good news for the 700 firefighters working to get a number of wildfire under control in Wood Buffalo, one being the Richardson Lake fire which is now north of 500,000 hectares in size and one of the largest in Alberta's history; it's bad news for the local boaters as the lake is closed until said bomber flies away for good. 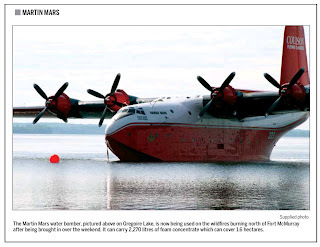 You see, not only does the Mars need much of the lake to take off - it is 117 feet long with a wing span of 200 feet - it also needs the lake to satisfy its thirst for water. Knowing this I surmised that the boat launch would be an awesome spot to do some lake fishing while Heather and the boys were playing at the beach. Normally, you have limited access to the water because boats are coming and going most of the time. I was right. So, I grabbed a spot and enjoyed a couple of hours of fishing time. The Hawaii Mars was floating off to the left, about 50 metres or so off the shore, waiting for its flying orders. Well, it might as well have been the Statue of Liberty with the amount of attention it grabbed. Residents were rotating in and out the entire time I was there - iPhones, BlackBerrys, digital cameras and camcorders in hand capturing the scene in deferential reverence to the giant orange and white flying fortress floating in the water. "It's normally gone at this time of day," said the Ranger engaging the tourists. He didn't know why it was sitting idle, but it offered him the opportunity to share some salient facts. "It is here with a crew of twenty - that includes maintenance and ground support and of course, the air crew." Ears tuned in, I heard him say that it cost the province about $80,000 per day to cover the costs of services delivered by the fire smothering leviathan. "How much water does it carry?" asked one person. "Let's put it this way: if it were to drop a full load on your home, your house would be flattened." Size matters, and when people find out that the biggest of something is in town, they flock to it. They came out of their cars, off their bikes, out of the bushes, drawn to it like it was an extraterrestrial space vehicle. They came and they kept coming, and I kept fishing. They got their pictures and videos; I got a tan and not much else.